Tessa is a feral dog that will need months of love, care and dedication. Tessa was living in filth when we found her. She had just given birth to 3 puppies. The puppies were healthy and thriving. 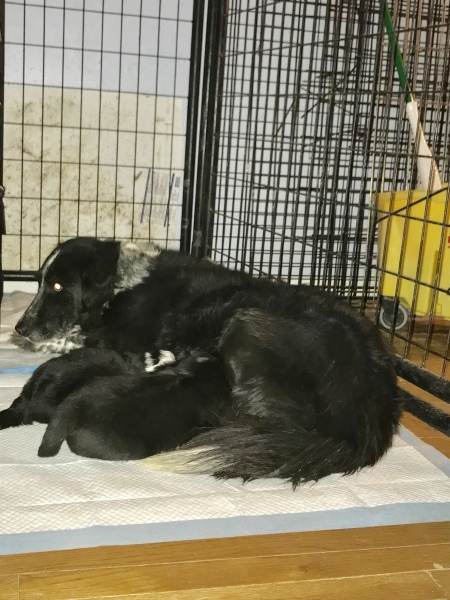 Although not the best circumstances, we decided it was best to leave her for now rather than stress her and put her and her puppies health in jeopardy. Unfortunately, when we checked on Tessa the 2nd time, a pup was missing. We don't know what happened and were unable to locate it despite hours of searching. It was at that point the decision to move mom and pups was made. Tessa's pups have all been adopted and Tessa is very slowly settling in and learning to be a pet. She's enjoying the pampered life but is still working on getting to know people.